I gathered up all the small balls of yarn for the March Madness project, and it made me stop and think. I thought about all the different pairs of socks I had made. I recalled the different knitting lessons I learned and new techniques I tried. I reflected on who received each pair. I got the itch to knit more socks. On the needles now are socks for my nephew. I just got him to try one on that had made it about halfway down his foot. I wanted to check the fit, but we just weren't on the same wavelength. I asked him how it feels, and he told me that he likes socks that make it all the way to the end of his toes. Yes, dear, I'll keep knitting. The good news is that what I have knit so far fits him pretty well. The other good news is that I have already mailed out my contribution for March Madness. It should be there soon. Here are the completed Frolicking Shamrock Socks. I really enjoyed knitting these. They have my mind swirling with other bead ideas. I've been using the little beaded shamrock motif to knit some little pins for today. I'm gathering up the bits and baubles of leftover sock yarn to help with this project. It's yet another reason to get the current socks off the needles. I think I'll have them ready in time for St. Patrick's Day. I've finished all but the last two rounds of beading. I ended up doing all of that plain knitting because my other shamrock patterning did not give me the look I wanted. Better luck on the next pair, eh? Knitting with beads has been quite enjoyable. Now I'm knitting some pins using the beaded shamrock motif from my socks. My nephew asked me to knit something green for him to wear Friday. Maybe we should pick him up early and take him to the parade. I don't know, though. That would require getting up early. I finally began knitting my Frolicking Shamrocks. I've got the toe done on one, and I'm halfway through the toe on the other. I want to finish up that part tonight and get them both on the needle (I'm doing Magic Loop 2-on-1). I was knitting them while we were out today, but hadn't brought my bag in from the car. I had begun to settle in for the evening when I realized where my knitting was. My sweetums isn't feeling well and was already in the bed. If I wanted to knit, I needed to go out to the car myself. I didn't feel like getting dressed again, yet I wanted to knit. But wait, it's a PJ Weekend over at our local Bruster's. So, I hopped in the car, got my free ice cream, and brought my knitting in when I came back inside. I think I know how I'll modify my socks. 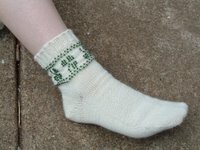 Instead of all that plain knitting, I'm going to work shamrocks up the foot of my sock. I was going to use the shamrock graph in the pattern and replace beads with purl stitches, but I wasn't wild about the look. Then I remembered a shamrock pattern over at the Dishcloth Boutique. Over on page 3, there it is: Reversible Shamrock. I like the looks of that, and I'm going to work those into the socks. I think it will be mighty nifty. If I don't like the looks of it, I can always try something else. Afterall, it's my knitting. 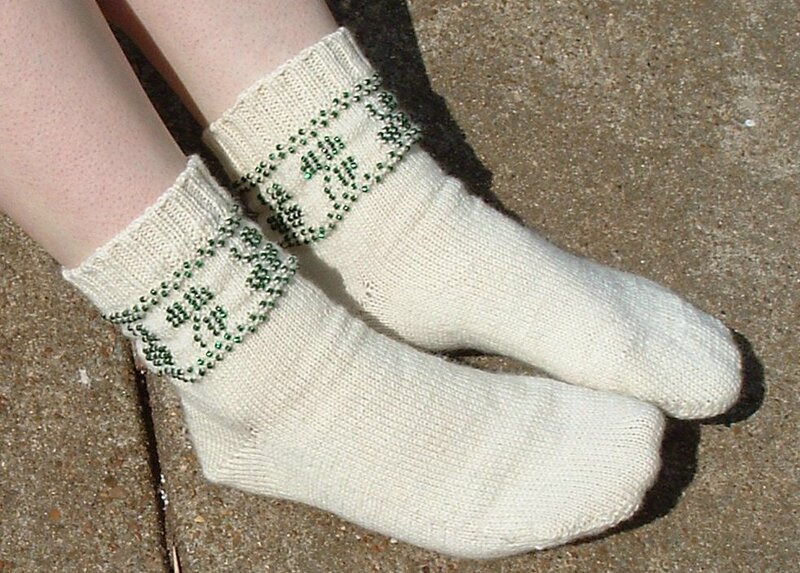 Over at The Knitting Zone, they are having a knitalong for Jackie E-S's Frolicking Shamrocks socks. There is also a free companion pattern for wristlets. I've looked at these socks before, but was a bit unsure. I think I have a plan to change it up a bit. I love the beading, but there is quite a lot of plain knitting. That can be a bit tedious, so I'm going to try something a bit different. After the beading, I plan to carry the frolicking shamrocks patterning down the leg and top of the sock using purl stitches. Actually, I think I will be doing that in reverse. I want to start the socks at the toe. Yes, this is another change, but not a biggie. However, I have already prestrung my beads as per the instructions. Since I don't plan to battle those beads whilst knitting the rest of the sock, I've got a bit more prep work to do before I finally cast on for these puppies. Yes, I am behind everyone else, but I finally did finish the socks for my sweetie pie that have been on the needles for so long. I'll get him to pull the socks on long enough to take a picture. We're in the midst of a warm spell around here, so he's not going to be wearing these socks just now. Oh yeah, and this is the first button I've ever made!